Honda has given us a brief glimpe at the facelifted 2012 Pilot which will hit dealerships this September. The Honda Pilot has always been synonymous as being a safe, reliable, and roomy family hauler. When the new generation arrived a few years back, many were put off by its awkward styling but still couldn&apos;t resist its quirky charms. And now, Honda has just released an official image of the 2012 Pilot. Unfortunately, we cannot really see any major changes but it&apos;s clear its had a bit of a nip/tuck. More importantly, Honda claims that the upcoming Pilot will be a more fuel efficient SUV. We can expect to see a six-speed automatic transmission replace last year&apos;s five-speed unit. There&apos;s also word that the interior has been given a little upgrade as well. For now, Honda has confirmed they&apos;ve tweaked the navigation and audio systems. Both have drawn complaints in the past from owners who described them as being difficult to use. Other than the few mentioned updates and the apparent front-end facelift, little else has been modified to the SUV. No word yet as to whether there&apos;ll be any engine changes. 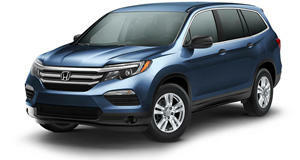 Honda claims that the upcoming Pilot will be arriving at dealerships this September.